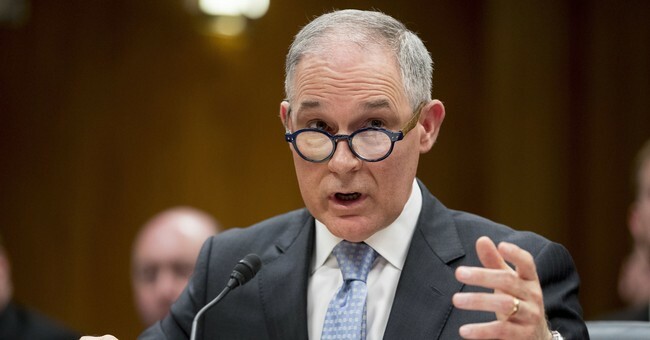 The Environmental Protection Agency did some damage control to try and explain why former EPA Chief Scott Pruitt suggested last year that humans were not primarily to blame for climate change. He made the comment during an interview about the Trump administration's reversal of some of President Obama's environmental rules on CNBC's "Squawk Box." The agency released documents to show that Pruitt did not read enough scientific material before his interview. These internal emails were provided to the Public Employees for Environmental Responsibility, who filed a FOIA request demanding to know what information Pruitt relied on for the interview. “In addition to the above search, EPA presented the twelve pages of material…to the former Administrator before his departure from the Agency and asked him if he was aware of any other agency records that he relied upon to make the statement on the Squawk Box appearance," an EPA lawyer told PEER. "The former Administrator identified no additional responsive records." Pruitt's nomination in 2016 had been condemned by environmental activists - including very famous ones like Leonardo DiCaprio - because of his views on climate change. DiCaprio even took his concerns directly to the president-elect. Pruitt resigned last month following a host of scandals. Some conservatives considered it a massive loss, considering he made good on his pledge to get rid of many burdensome environmental regulations. Yet, his replacement, Andrew Wheeler, may be even more effective at it.